Temporal arteritis, also known as giant-cell arteritis and cranial arteritis, is a systemic vasculitis of medium-sized and large-sized arteries. It is the most common systemic vasculitis of older adults. Symptoms of temporal arteritis can be either constitutional or vascular-related. Constitutional symptoms include fever, weight loss, anemia, and fatigue. Vascular-related symptoms arise secondary to arterial inflammation with luminal stenosis and resultant end-organ ischemia. Temporal arteritis may also involve the aorta and may be associated with aneurysm, dissection, and aortic rupture. The typical involvement of the temporal, vertebral, and ophthalmic arteries leads to the classic clinical manifestations of headache, facial pain, and vision problems. Inflammation of the ophthalmic artery can lead to irreversible blindness of sudden onset. Vision loss in temporal arteritis constitutes a medical emergency. Temporal artery biopsy is the criterion standard for establishing the diagnosis of temporal arteritis. 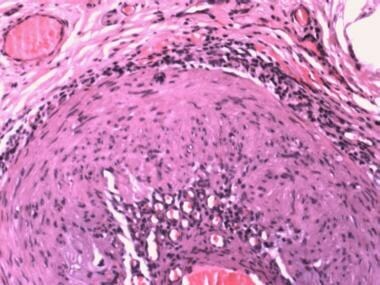 A positive histologic diagnosis demonstrates inflammation of the arterial wall with fragmentation and disruption of the internal elastic lamina (see the image below). 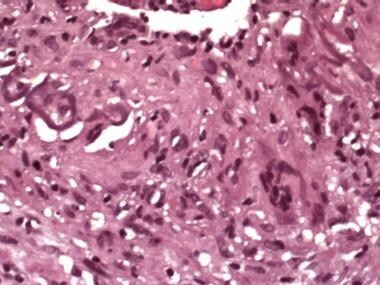 Multinucleated giant cells are found in fewer than 50% of cases and are not specific for the disease. Temporal arteritis occurs in 3 histologic patterns: classic, atypical, and healed. 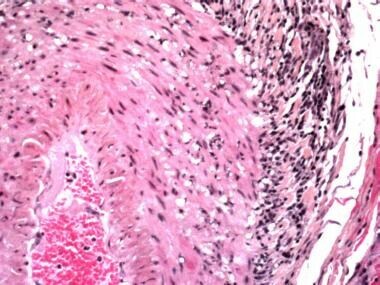 Regardless of histologic subtype, the disease typically responds well to rapid administration of systemic corticosteroids. The etiology of temporal arteritis is multifactorial and is determined by both environmental and genetic factors. Data indicate that the disease is probably initiated by exposure to an exogenous antigen. Numerous viruses and bacteria have been proposed as potential precipitants, including parvovirus, parainfluenza virus, varicella zoster virus, [5, 6] Chlamydia pneumoniae, and Mycoplasma pneumoniae. T cells are recruited to the vessel wall after initial exposure to the antigen. They release cytokines that act on local macrophages and multinucleated giant cells. The response of the macrophages and multinucleated giant cells to the cytokines depends upon their location within the vessel wall. Adventitia-based macrophages produce interleukin-6 (IL-6), which further augments the inflammatory cascade. Macrophages within the media produce oxygen free radicals and metalloproteases, which degrade the arterial wall and fragment the elastic lamina. With the disruption of the internal elastic lamina, the intima becomes accessible to migrating myofibroblasts, which proliferate and lay down extracellular matrix. Temporal arteritis shows a predilection for the vertebral arteries, the subclavian arteries, and the extracranial branches of the carotid arteries (ie, the superficial temporal, ophthalmic, occipital, and posterior ciliary arteries). Temporal arteritis and giant-cell aortitis are related; the inflammation may involve the aortic wall and, rarely, the femoral and coronary arteries. The onset of symptoms in temporal arteritis may be either gradual or sudden. Arterial wall infiltration by lymphocytes and macrophages leads to luminal stenosis and occlusion of the vessel. Consequently, many of the clinical symptoms reflect end-organ ischemia. The branches of the internal and external carotid arteries are at particularly high risk. Their involvement produces the classic clinical manifestations of jaw claudication, headache, scalp tenderness, and visual disturbances. One of the most important potential complications of temporal arteritis is complete or partial vision loss, a phenomenon that occurs in at least 1 eye in as many as 60% of patients. [9, 13] Blindness results from occlusion of the inflamed ophthalmic or posterior ciliary arteries with resultant ischemia of the optic nerve or tracts. Other potential visual disturbances that may precede vision loss include diplopia, amaurosis fugax, hallucinations, blurred vision, and eye pain. Polymyalgia rheumatica (PMR) is characterized by stiffness and pain of the proximal joints. It occurs in 50-75% of patients with temporal arteritis. [2, 10] Vision loss is not a feature of PMR. PMR may progress into clinical temporal arteritis and is considered by some to represent a different phase of the same disease. The differential diagnosis for a patient who presents with only the systemic inflammatory symptoms of temporal arteritis is broad. Systemic infections, connective tissue diseases, and malignancies may have similar clinical features. Primary systemic amyloidosis can mimic the symptoms of both PMR and temporal arteritis. Patients with a monoclonal band on immunoelectrophoresis and a poor response to systemic corticosteroids should have a Congo red stain performed on a temporal artery biopsy. The ophthalmic features of temporal arteritis can be mimicked by nonarteritic anterior ischemic optic neuropathy (NAION), a disease characterized by visual disturbances in patients with cardiovascular risk factors and a susceptible ”crowded” optic disc. Several vasculitides and connective tissue disorders can present with similar systemic and ophthalmic manifestations, including systemic lupus erythematosus (SLE), rheumatoid arthritis, polyarteritis nodosa, Churg-Strauss syndrome, microscopic polyangiitis, Takayasu arteritis, and polymyositis. 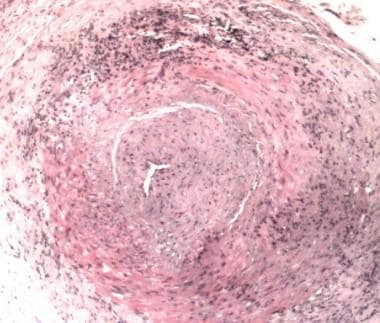 Differences in systemic organ involvement, microscopic findings, and distribution of lesions can help distinguish these entities from temporal arteritis. Compressive intracranial lesions, both malignant and benign, may also be considered in the differential; these can be ruled out with neuroimaging studies. Corticosteroids act to suppress the inflammatory response in temporal arteritis and limit the ischemic complications of the disease. It is universally agreed that corticosteroid therapy should be initiated as soon as the diagnosis is suspected and that steroids should be given even before the biopsy is obtained. Early initiation of therapy has been shown to reduce the risk of blindness and stroke. There is no consensus regarding the optimal dosage and duration of corticosteroid administration. Generally, however, the greater the visual loss or potential for visual loss, the larger the steroid dose required. Individual treatment regimens are based on clinical presentation, symptom severity, response to treatment, and development of adverse side effects. To minimize the risk of complications associated with prolonged corticosteroid therapy, doses are gradually tapered to a minimally suppressive amount that induces clinical remission. Various immunosuppressive agents are now being considered for their potential steroid-sparing effects. Conflicting results have been obtained with these agents however, and high-dose systemic corticosteroids are still the mainstay of treatment. Segments of affected arteries develop nodular thickenings that produce stenosis of the lumen. 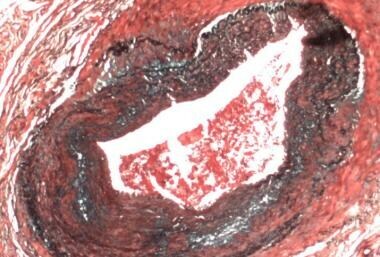 The lesions may be associated with thrombi, which occasionally organize and transform the artery into a thick fibrous cord. Aortic involvement by giant-cell aortitis may give the luminal surface a longitudinal wrinkled look, the so-called tree-bark appearance. This finding is not pathognomonic for giant-cell arteritis and is found in all types of aortitis. The tree-bark appearance is secondary to alterations occurring in the media, including elastic fiber fragmentation, loss of medial smooth muscle, and medial scarring. For gross examination of the specimen, the size of the arterial biopsy should be described and the entire specimen processed without sectioning. After processing, the histotechnologist should cross-section the vessel at 2-3 mm intervals and place the cross-sections in embedding cassettes for paraffin embedding. This postprocessing cutting method is optimal because it ensures good orientation of the vessel segments. The cross-sections should be cut in serial sections onto slides. Interval staining of slides is performed. If staining is negative, the tissue should be completely sectioned and depleted to ensure that any focal involvement is not missed. There are 3 main patterns of vascular damage in temporal arteritis. The first is the classic pattern, characterized by marked intimal thickening and transmural inflammation. A dense inflammatory infiltrate composed of T cells and histiocytes is present. 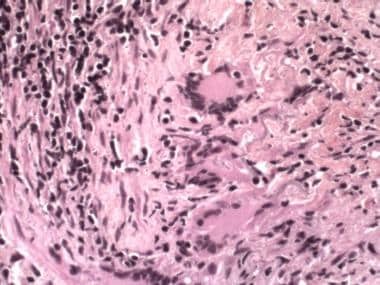 Fusion of histiocytes results in the classic microscopic appearance of granulomatous inflammation with multinucleated giant cells (foreign body and Langhans types; see the images below). This finding is present in fewer than 50% of cases and is not specific to temporal arteritis. Temporal arteritis: atypical features, adventitial heavy inflammation. Temporal arteritis: adventitia and intimal inflammation dominating, atypical features. Temporal arteritis: fragmented internal elastic lamina. Temporal arteritis: large gap in internal elastic lamina, best seen with elastic stain (Movat pentachrome, in this example). On the basis of its familial, ethnic, and geographic distribution, temporal arteritis appears to have a genetic predisposition. Studies have shown familial clustering and monozygotic twin concordance. Most genetic factors center on the human leukocyte antigen (HLA) genes. It is likely that various HLA alleles predispose to temporal arteritis and mediate its severity. Individuals homozygous for HLA-DR4 and the FCGR2A-131RR allele have a 6-fold greater risk of developing temporal arteritis. HLA-DR1, HLA-DR3, and HLA-DR5 may also be associated with a higher incidence of the disease. Polymorphisms in immunomodulating proteins such as interleukin-1 receptor antagonist (IL-1ra), tumor necrosis factor alpha (TNF-α), and intracellular adhesion molecule-1 (ICAM-1) have also demonstrated an increased association with temporal arteritis. Before the advent of corticosteroids, most patients afflicted with temporal arteritis lost their vision. With current adequate therapy and rapid diagnosis, the incidence of blindness has been lowered to 9-25%. Once vision loss has occurred, however, it cannot be reversed by corticosteroid therapy. In a study that evaluated disease flares (relapses and recurrences) in 174 patients with biopsy-proven temporal arteritis, the 71 (40.8%) who experienced relapses or recurrences did not show clinical differences when compared with the other patients, but they had received corticosteroid therapy for a significantly longer time. The investigators concluded that a chronic inflammatory response manifested by anemia at the time of disease diagnosis (see Clinical Features and Imaging) may predict the development of disease flares. Le K, Bools LM, Lynn AB, Clancy TV, Hooks WB 3rd, Hope WW. The effect of temporal artery biopsy on the treatment of temporal arteritis. Am J Surg. 2015 Feb. 209 (2):338-41. [Medline]. Cantini F, Niccoli L, Nannini C, Bertoni M, Salvarani C. Diagnosis and treatment of giant cell arteritis. Drugs Aging. 2008. 25(4):281-97. [Medline]. Rahman W, Rahman FZ. Giant cell (temporal) arteritis: an overview and update. Surv Ophthalmol. 2005 Sep-Oct. 50(5):415-28. [Medline]. Gilden D, Nagel M. Varicella Zoster Virus in Temporal Arteries of Patients With Giant Cell Arteritis. J Infect Dis. 2015 Jul 15. 212 Suppl 1:S37-9. [Medline]. Gilden D, White T, Khmeleva N, et al. Prevalence and distribution of VZV in temporal arteries of patients with giant cell arteritis. Neurology. 2015 May 12. 84 (19):1948-55. [Medline]. Weyand CM, Goronzy JJ. 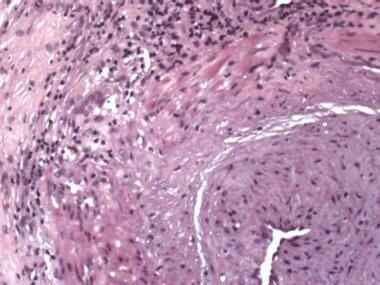 Pathogenic principles in giant cell arteritis. Int J Cardiol. 2000 Aug 31. 75 Suppl 1:S9-S15; discussion S17-9. [Medline]. Watanabe R, Maeda T, Zhang H, Berry GJ, Zeisbrich M, Brockett RD, et al. Matrix Metalloprotease-9 (MMP-9)-Producing Monocytes Enable T Cells to Invade the Vessel Wall and Cause Vasculitis. Circ Res. 2018 Jul 3. [Medline]. Gravanis MB. Giant cell arteritis and Takayasu aortitis: morphologic, pathogenetic and etiologic factors. Int J Cardiol. 2000 Aug 31. 75 Suppl 1:S21-33; discussion S35-6. [Medline]. Weyand CM, Goronzy JJ. Pathogenic mechanisms in giant cell arteritis. Cleve Clin J Med. 2002. 69 Suppl 2:SII28-32. [Medline]. Gonzalez-Gay MA, Garcia-Porrua C, Llorca J, et al. Visual manifestations of giant cell arteritis. Trends and clinical spectrum in 161 patients. Medicine (Baltimore). 2000 Sep. 79(5):283-92. [Medline]. Kimura T, Komura M, Okubo Y. Atypical giant cell arteritis predominantly involving intramural coronary arteries: a case showing refractory dialysis-related hypotension. Heart Vessels. 2011 Jun 8. [Medline]. Pineles SL, Arnold AC. Giant cell arteritis. Int Ophthalmol Clin. 2007 Fall. 47(4):105-19, x. [Medline]. Klink T, Geiger J, Both M, Ness T, Heinzelmann S, Reinhard M, et al. Giant cell arteritis: diagnostic accuracy of MR imaging of superficial cranial arteries in initial diagnosis-results from a multicenter trial. Radiology. 2014 Dec. 273 (3):844-52. [Medline]. Meisner RJ, Labropoulos N, Gasparis AP, Tassiopoulos AK. How to diagnose giant cell arteritis. Int Angiol. 2011 Feb. 30(1):58-63. [Medline]. Morinobu A, Tsuji G, Kasagi S, Saegusa J, Hayashi H, Nakazawa T, et al. Role of imaging studies in the diagnosis and evaluation of giant cell arteritis in Japanese: report of eight cases. Mod Rheumatol. 2011 Aug. 21(4):391-6. [Medline]. Klein RG, Campbell RJ, Hunder GG, Carney JA. Skip lesions in temporal arteritis. Mayo Clin Proc. 1976 Aug. 51(8):504-10. [Medline]. ter Borg EJ, Haanen HC, Seldenrijk CA. Relationship between histological subtypes and clinical characteristics at presentation and outcome in biopsy-proven temporal arteritis. Identification of a relatively benign subgroup. Clin Rheumatol. 2007 Apr. 26(4):529-32. [Medline]. Allsop CJ, Gallagher PJ. Temporal artery biopsy in giant-cell arteritis. A reappraisal. Am J Surg Pathol. 1981 Jun. 5(4):317-23. [Medline]. Font RL, Prabhakaran VC. Histological parameters helpful in recognising steroid-treated temporal arteritis: an analysis of 35 cases. Br J Ophthalmol. 2007 Feb. 91(2):204-9. [Medline]. Poller DN, van Wyk Q, Jeffrey MJ. The importance of skip lesions in temporal arteritis. J Clin Pathol. 2000 Feb. 53(2):137-9. [Medline]. Smetana GW, Shmerling RH. Does this patient have temporal arteritis?. JAMA. 2002 Jan 2. 287(1):92-101. [Medline]. Martinez-Lado L, Calviño-Díaz C, Piñeiro A, Dierssen T, Vazquez-Rodriguez TR, Miranda-Filloy JA, et al. Relapses and recurrences in giant cell arteritis: a population-based study of patients with biopsy-proven disease from northwestern Spain. Medicine (Baltimore). 2011 May. 90(3):186-93. [Medline].